In election Britain this last week has been consumed with business and finance, mainly the hedge funds, lambasting Labour for being ‘anti-business’, as though massive indulgence in tax avoidance and continued insistence on de-regulation of finance were the conditional requirements of a successful global economy. Actually they are the forerunners of the next financial collapse which may be sooner than many people anticipate. Consider the evidence. The world is awash with much more debt than before the epic financial crash of 2008-9. In 2000 the global stock of debt outstanding (at constant 2013 exchange rates) was $87 trillions. By the end of 2007, just before the crash it had risen to £142 trillions, and by 2014 to $199 trillions. This represents a 40% increase in world debt in just 7 years, which is staggering both in terms of the size of the debt pile and the rate of its build-up. It need hardly be said that this is extremely risky, especially when proposed reforms of the banking sector are very meagre and not set to come into effect till 2019. It is worrying too that debt mountains are growing fast in almost all the world’s biggest economies. Since 2007 the debt-to-GDP ratio has accelerate by 72% in Spain, 68% in Sweden, 66% in France, 64% in Japan, 62% in the Netherlands, and 55% in Italy – even leaving on one side the outliers like Ireland where it has grown by 172%, Greece by 103%, and Portugal by 100%. Perhaps most concerning of all, China’s debt quadrupled in this short 7-year period to 282% of GDP, a higher ratio than the US or slightly lower if the financial sector is excluded. 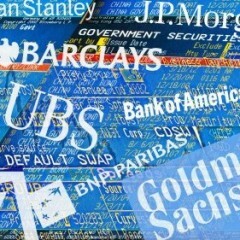 Not only that, but all the biggest banks, including the Big 4 in the UK, are now substantially bigger than in 2008-9 when they were judged to be ‘too big to fail’ and therefore had to be bailed out at colossal taxpayer expense which nevertheless paved the way for the longest, most anaemic recovery since the second world war. The only banking reform measures contemplated in the UK are the ‘bailing-in’ of failing banks, though the mechanics proposed are widely expected to be ineffective, and the Vickers Commission’s proposals for setting up ‘Chinese walls’ between banks’ retail and investment arms, which City lawyers and accountants will make hay with through regulatory arbitrage. To cap it all, Osborne’s only hope of maintaining the recovery is by prompting a further big increase in household borrowing, precisely the wrong basis for securing sustainable growth. It is already at a level in excess of £2 trillions, and still heading north. Once interest rates eventually rise from their 6-year next-to-zero level, the rate rise which the City is craving for will cut a huge swathe through the livelihood of half the population already decimated by years of prolonged austerity. Both globally and nationally this is the old order in its death throes. £1.4 trillion personal debt – some recovery! Posted in: Economy, Finance, Prices/Inflation.